The Native American Indigenous Church (NAIC) and The SomaVeda College of Natural Medicine (SCNM) will be participating and supporting the 10th. 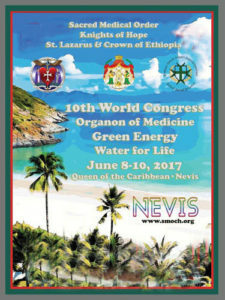 Annual World Congress of Natural Medicine. The focus of this years congress will be Indigenous, Traditional, Native and Natural Medicine. Dr. Anthony B. James, Chairman of the NAIC and Medical and Educational Director of SCNM/ Thai Yoga Center in Brooksville, FL will be presenting on the Indigenous Ayurveda and Traditional Yoga Therapy Practices of Thailand. All SomaVeda® Thai Yoga students, practitioner’s and teachers as well as anyone truly interested in international standards of practice in Natural Medicine. This June 2017, will mark our 10th World Congress as testament to our dedication and longevity. The forum above all else promotes brotherhood and sisterhood under the arena of natural and indigenous medicines. Our keynote speakers represent those in the height of their field of endeavors, and our 9th world congress, Tampa, 2016, being our most successful to date. As indigenous peoples, it is in our best interests to observe the United Nations Treaty of Montevideo, and establish formal diplomatic relations with as many like-minded peoples in our crusade for unification of indigenous peoples and their cultures and medicines. The UN Convention on Diplomatic Relations confirms that “all nations from ancient times have recognized… privileges and immunities” of sovereign entities of “differing constitutional and social systems” including historical institutions (Preamble). It requires that a “State shall not discriminate as between States” including a historical institution possessing statehood (Article 47.1). The UN Convention on Consular Relations further recognizes the customary protocols of sovereign relations “since ancient times” (Preamble). The UN Convention on the Law of Treaties mandates that this clear and direct recognition of historical customary law, declared as fundamental principles in those two UN conventions, is made binding upon all countries. It specifically recognizes the validity of “subjects of international law”, and establishes that the absence of ratification of a Convention by any countries “shall not affect… The application to them of any of the rules… to which they would be subject under international law independently of the Convention.” (Articles 3, 38). We invite all like-minded practitioners and organizations to celebrate with us, in this 10th World Congress, to be held on the peaceful island of Nevis, Queen or the Caribes, June 8-10, 2017. Click Here for Full Color Brochure! For more details and Registration Information Click Here!